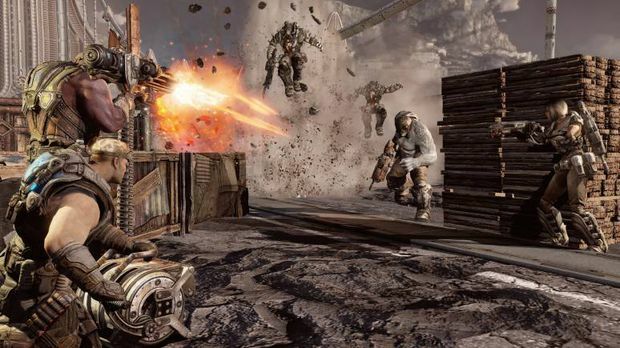 We've heard all about Gears of War's multiplayer. Most of the fans have played it extensively thanks to the beta. That's all fine and dandy, but I'm a big supporter of the campaign mode and that's definitely what I wanted to know more about this E3. Naturally, I got my wish, as Gears designer Cliff Bleszinski sat us down for a quick look at the story mode, and some of the hotness that you'll be able to experience in what's set to be the most rousing story of the series thus far. 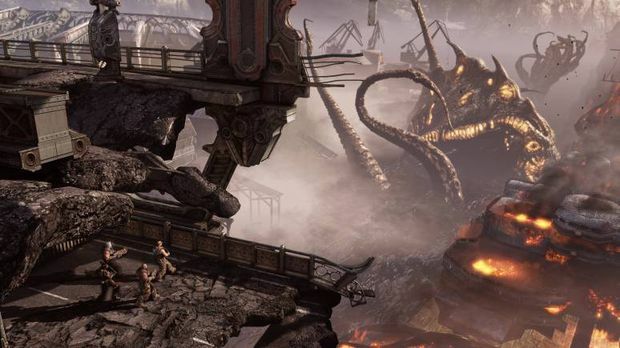 If you watched Microsoft's E3 press conference, you'll know that there's a level in which Marcus Fenix and his Delta Squad face off against a gigantic serpentine creature. In order to do this, players are going to need the help of a new toy -- The Silverback. The Silverback is a thundering mech with three distinct uses. You can move around the battlefield with a machine gun at your disposal or you can remain stationary and utilize the mech as a rocket-launching turret. Leaving the mech causes it to transform and throw up a heavy steel wall, giving you mobile cover in convenient positions. The Silverback looks like it's going to be a lot of fun, especially when it's used to shoot a monstrous snake's eyeballs out. That's what you do, by the way, and I'm thrilled to report that Gears of War 3 boasts the juiciest, gloopiest eyeball-burst effects I've seen in a long time. 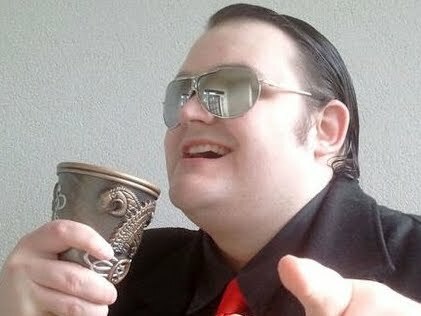 During the mission, Marcus receives a call from series regular Augustus "Cole Train" Cole, stating that he's in position. This position, it turns out, is a bridge above the monster's head, where Cole's squad is pushing a large crate of explosive Ticker creatures. The crate drops onto its side and swings open, unleashing a payload of Tickers onto the boss monster's head. Delightful. However, this is not the end of the encounter. Gears of War 3 has what Bleszinski calls a "Pulp Fiction," narrative structure, drawing inspiration from the films of Quentin Tarantino to re-tell the story from multiple points of view. After Marcus has defeated the boss, we then replay the situation with Cole and Baird's squad, up on the bridge. Here, the objective is to break through the Locust and topple the Ticker tank. Bleszinski told us that he loved this new take on the campaign because it gave us more Cole Train, "Which is great because I think Cole's just awesome." It's as noble a narrative goal as I've ever seen. 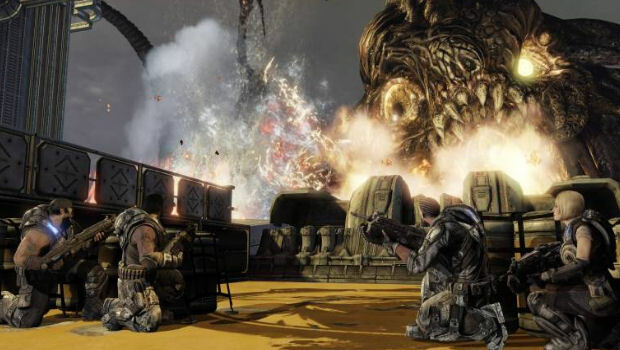 The bridge battle reveals that Gears of War 3 is indeed the Gears we've come to know, with intense cover-based shootouts that provide plenty of blood and messy headshots. I'm impressed by how much more colorful the game is compared to its predecessors. The bright skyline of a level set in daytime is contrasted by the deeper, richer colors of both the Gears and their Locust enemies. Characters "pop" a lot more this time around, and I'd say that anybody who accuses this game of being "brown and boring" in the aesthetic department are lying little toads. The demo ends on a cliffhanger, with Baird possibly falling to his death after an emotional moment in which he tells female ally Sam what's really on his heart, "I suppose you want me to say I've always loved you but ... I don't." We were told that Gears of War 3 will wrap up a lot of the series' prominent questions and will also feature an "Anyone can die" story, heavily hinting at the possibility of us losing a few characters in a shocking fashion. Although we didn't get to see any of it during this presentation, Bleszinski was very proud to talk about Horde 2.0, the follow-up to the immensely successful wave-based Horde mode found in Gears of War 2. "We didn't invent that type of gameplay," admits the designer, "but we defined it this generation. When people talk about that gameplay now, they call it a horde mode." In Horde 2.0, players will be able to spend the cash they earn for kills and build defenses in order to keep the Locust at bay. You'll start with piddly little walls, which you can improve with barbed wire and more durable materials. If you play well and spend wisely, you'll be able to create a sweet little base for yourself. According to Bleszinski, such bases will be invaluable once the game starts throwing boss fights at you. 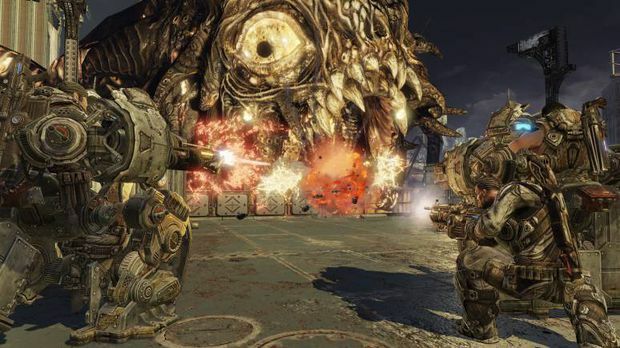 Multiple Boomers and huge Brumak enemies will provide challenging breaks from the waves of regular enemies, and Epic has promised that some of these encounters will be damn hard. You can consider me well and truly pumped for yet another excursion into the world of Gears of War. It looks gorgeous, it presents itself with unmatched confidence and it looks set to deliver all my manliest of needs. There's little doubt that this'll be a heavy game of the year contender.